Cafe Coffee Day or CCD is a popular franchise chain that has recently invaded Darjeeling as well. A branch located right on the Chowrasta Mall, it has taken over the space that was earlier occupied by the Stardust. If you stand in front of the CCD, there is the familiar statement "A lot can happen over coffee". But what is a little unusual is the logo of CCD which has the name of the cafe written in Hindi as well. And the short flight of stairs leading to the entrance door is often used by children to sit and relax. As you enter the cafe, the space is really large. There are impressive round glass topped tables with cushioned chairs on the right. After you cross over the row of tables, the large counter with glass cabinet is on the right. The coffee and snacks served are the same as what you would get in any other CCD in your city. There are sandwiches and burgers of various types, and coffee from the fresh roasted beans come in various flavors. However you will also get great Darjeeling tea here. At the end of the large room, there are large comfy sofas and the view behind is exceptional. There are large glass pane window at the end of the room from where you get spectacular view of the valley and mountains including that of the snow covered peaks. I met up with Cake Lady here as we chatted for over an hour over coffee. The Cake Lady is a New Zealander who has settled in Darjeeling for her sheer love for the hill town. To make her living, she prepares delicious cakes and supplies to various outlets in Darjeeling. CCD too keeps her cakes which you can buy by slices or as whole cakes. Remember, these are cakes and not the usual pastries, but they are great and come in different flavors. We both took the black coffee. They serve sugar cubes or Sugar Free sweeteners separately. A unique and a great feature of this CCD is its outdoor patio or the terrace. The terrace is really large and opens out on one side to the mountains. On the other side, it faces the mall. There are giant umbrellas here with seating arrangements. On a bright morning, take your coffee and lounge in the sun at the terrace with wonderful views all around - it's a special experience. I do it every time I am in Darjeeling. 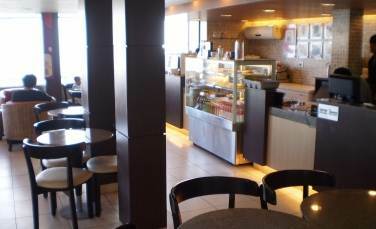 The Cafe Coffee Day (CCD) in Darjeeling is located at the Mall. As you enter the Chowrasta Mall from Nehru Road, it will be on your right and opposite to Fiesta Restaurant. You won't miss this one due to its prominent presence in the Mall. The CR Das Road that leads to the Desbandhu Museum Step Aside starts close to CCD. You will see the signs of that right in front of the Cafe.